The Doberman Pinscher is a favorite breed of large, graceful dogs, known for their confidence and highly trainable natures. These dogs are well known for their intelligence, as well as their physical power. Despite having the old stereotype of being a curt and even aggressive breed, these dogs are quite capable of being affectionate especially among family. Dobermans are full of energy, so they prefer to be up and moving. They would not appreciate the role of a lap dog, even if their size would allow it. 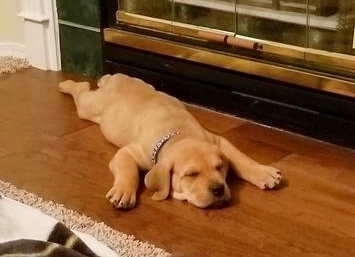 The breed is known to be energetic in whatever it does, excluding sleep. These dogs require daily exercise to keep them healthy, although regular exercise helps maintain the dog’s energy as well. The Doberman displays an appearance of bravery, confidence, and capability. Despite the tough exterior, however, the breed is known to be sensitive. They will react to severe treatment, becoming anxious and aggressive as a result. They are susceptible to the cold and should not be left out in cold temperatures for too long. While the Doberman is suspicious and alert to strangers, it is quite the opposite with its family. Dobies are social with their owners and prefer to be around them. They like to play games, and especially hate being left alone. The breed is prone to separation anxiety and is not recommended for owners who are not home, at least, some of the day. These dogs are capable of being gentle and coexisting with children too. The Doberman’s outward appearance is intimidating, however, so it is important to let kids know the dog is not a threat. These dogs love to play, but should be monitored when playing with small children. Some have been known to be overprotective of the family’s children. Given the dog’s size, small or frail people can get knocked down, especially when these dogs are excited. While they are reliant on human company, they do like to wander off. To keep a Dobie from taking a walk when it feels like it, owners will often provide an enclosure for it when outside. A sturdy, tall fence is recommended, as a shock delivered by an invisible fence may be unable to subdue these dogs. They are also known to chase after any possible prey that passes by, reinforcing the need for an enclosure. The Doberman is quite capable of coexisting with other dogs. It is recommended not to have small breeds living with a Dobie, however, as they could be mistaken for a meal. Otherwise, the dog will appreciate the additional company. Another pet is another friend to play with, as long as the other dog allows the Doberman to be “boss.” Two male Dobermans should not live together, although, as this would likely lead to violence. Being a larger dog, the Doberman can build up an appetite. So long as they are provided with ample exercise, although, they are not prone to obesity. It is important to find the balance between exercise and the amount of food offered. These dogs are also known to drool, which may be an issue to some people or their guests. Not everyone likes dog saliva on their clothing and face as much as the next guy, so a “down” or “off” command is recommended. In the U.S. and some countries, the Dobie’s tail and ears are still cropped, but these practices have become outlawed in most of Europe. Ears have not been cropped or tail docked on this Dobie. Doberman Pinscher with cropped ears and docked tail. The Doberman is a relatively new breed, having been created towards the end of the 19th century. The breed originated in Germany, where Louis Doberman, a tax collector worked to create an impressive guard dog to assist and protect him as he worked. He used the German Shepherd Dog and the German Pinscher (thus the name) and likely added a little Greyhound. Weimaraner, Manchester Terrier, and Rottweiler into the mix. This ended up with a dog that has a wide variety of traits: guardian, tracking, endurance, speed and most of all, intelligence. 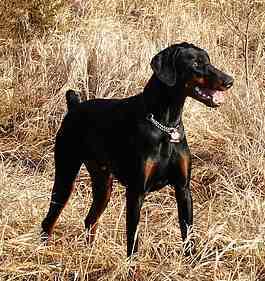 The breed was first shown in Germany in 1876, and after his death, these dogs adopted Doberman’s name. The breed was popular in Germany, where many enjoyed the skills of the dog when it came to working, especially as a guard dog. The Doberman saw extensive selective breeding in the late 1800s and early 1900s to help magnify their attractive traits. Breeders attempted to capitalize on the dog’s athletic prowess while making the dog more skillful at guarding. 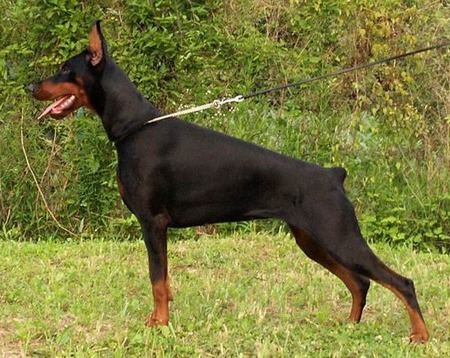 The product of this breeding was a Doberman that excelled as a working dog, but was aggressive and not suited as a pet. The first Dobermans made their way into the US in the early 1900s. They had great success in the country, quickly becoming a favorite breed. Americans appreciated the dog’s working abilities, but they wanted it to be a more rounded and sociable dog. U.S. breeders worked to help make this a reality. Through selective breeding, they were able to produce the more affectionate and social Doberman seen today. While the Doberman was just setting its roots in the new world, World War 1 was breaking out in Europe. Given the breed’s German origins, it was significantly affected by the war. The population of the breed decreased, as fewer people could afford dogs like the Dobie. Many members of the breed were soon owned by the wealthy aristocrats, which led to less variety in breeding. In the interval between the two World Wars, many Dobies made their way into the US. This migration was timely, as WW2 would also drastically affect European Dobermans. While the breed was being refined and bred in the US, it was dying off in Europe. During WWII, the U.S. Marine Corps chose the German, Doberman Pinscher as their official War Dog. (Now, just how ironic is that! While Europe was left in shambles by the second world war, the US came out of it quite well. The wartime industries had led to a booming economy, allowing for people to afford a higher quality of life. A higher quality of life includes luxuries, such as dogs, and many breeds were being purchased by the average family. The Doberman, alongside conspicuous consumerism, grew in popularity during this time. 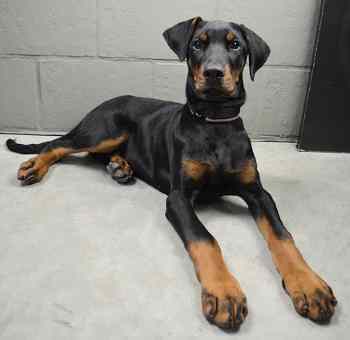 The Doberman continues to grow in its popularity in the US and the rest of the world. It was first registered by the AKC in 1908. Since then, the breed has become 14th most popular in the US. 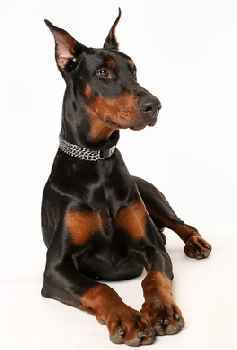 The Doberman Pinscher was created to be an attentive and intelligent dog that can follow orders. Owners find that these traits present to this day. This breed is very easy to train. It is most important to let a Doberman know who is in charge early on, or they may assume the position themselves. Owners will often take their dogs to obedience classes to help with the training process. While the Doberman may display an appearance of confidence and independence, this is not completely the case. These dogs are known to be somewhat sensitive, so how they are treated primarily affects their behavior. The route for training this breed is positive reinforcement, harsh reprimands for bad behavior will only make the dog more reluctant to learn. Altogether, the Doberman Pinscher is a fairly well behaved dog, once the owner has commanded the respect of the dog and housebroken it. They are relaxed with their families, but may not know how to act around guests. This breed is known to drool and shed, which some people find objectionable and guests may not be too fond of either. Guests are to be introduced to the dog formally, and the dog should treat them the same way they do family. Early socialization to sights, sounds, tastes, textures and smells is crucial when training any dog. Socializing a dog with other pets and people will make it more comfortable and social with those outside of the family. First exposure to many sights, sounds, and things will also make the dog less anxious and suspicious of things that are unusual to them. Frequent walks and obedience classes can help with this process. 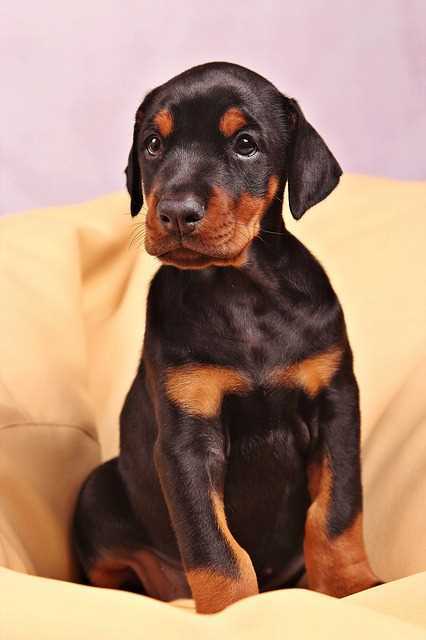 But socialization must start with the breeder, so keep that in mind when researching a good Doberman breeder. If a guard dog is what you want, then look no further. The breed itself was created in an attempt to produce biddable and alert guard dogs. These dogs are well suited for the job, given their athletic build, and wariness. They have an intimidation factor that they can back up if they need too, as well. The Doberman is probably the best guard dog in the world, although lacking the sheer weight and aggressiveness of the Caucasian Shepherd or the Boerboel. 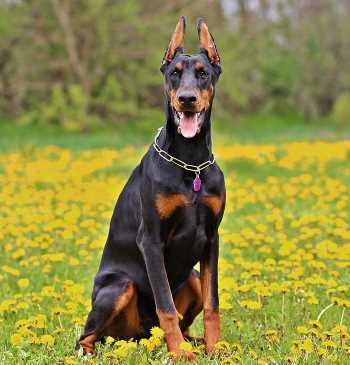 Should you want a canine defense system that does not put the dog in harm’s way quite as immediately, the Doberman Pinscher can be a great watchdog too. The breed is not very vocal, but they are accomplished at alerting their owners to the presence of an intruder. Their booming bark can be heard from afar, and maybe enough to make someone think twice about entering. You may have qualms about having a Doberman as a guard dog, but the dog probably does not. These dogs were bred to be fearless and loyal. Their suspicious personalities make them unlikely to greet a stranger expecting to be loved on and petted. This factor makes it difficult to have guests over, so it is important to help them make the distinction between friend and foe. There are no markings registered by the AKC for this breed. The Doberman Pinscher is an easy dog to groom. Their short coat hugs their body and does not need heavy maintenance. They do shed, however, so they still need to be brushed at least once a week to remove any loose hair. These dogs don't tend to be very dirty or odorous as well, so they only need bathed every other month, or as needed. It is just as important to brush a Doberman’s teeth as its coat. Dogs that do not have their teeth brushed regularly may feel tooth pain, and are at risk to cavities, as well as mouth infections. 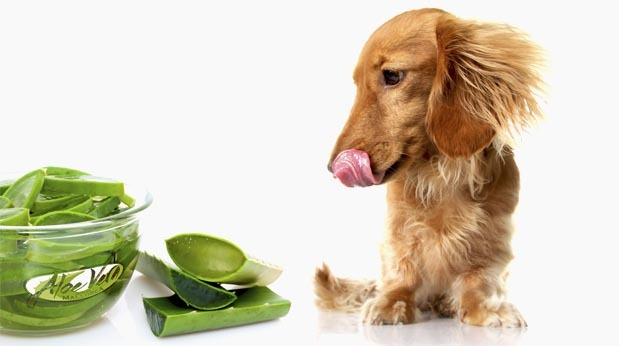 By brushing a dog’s teeth, you remove plaque, prevent tartar buildup, and help freshen up their breath. It’s recommended that these dogs have their teeth brushed at least 2-3 times a week. Clipping your dog’s nails is a necessity. If a dog’s nails become too long, they may become uncomfortable, even painful. The Doberman’s nails grow quickly, and should be clipped before they are too long, typically every 2 or 3 weeks. A good way to tell if their nails are too long is by listening to them clicking against the ground as they move. If you hear clicking, it may be time to break out the clippers. The Doberman’s larger ears, docked or not, can easily house bacteria. To prevent ear infections, it is important to check and clean their ears regularly. Cleaning their ears will remove excess wax and bacteria. It is recommended that they have their ears cleaned at least once a week. All in all, they are a very easy breed to groom and generally do not require professional grooming. Like people, dogs can get sick, and can be affected by all sorts of health issues. It is important to know about the possible health risks a dog faces when buying one, as well as provide the proper health care. Just because a condition is associated with a particular breed does not mean that your dog will be afflicted with the disease. It is important to purchase a dog from a reputable breeder, especially when one is looking for a very popular breed such as this. Breed popularity can create greed and lead to less than reputable breeders who do not take the time to research the background or genetic inheritance of the breed. A good breeder will know the breed in and out, and be able to pass health checks for their dogs.